Date and number of the decree of state registration of the object of cultural legacy: Decree #112 of the Board of Culture of Ternopil Region State Administration as of. There are not more than 197 tombstones. There are also mass graves of Jewish people shot in 1942. The cemetery is not fenced around; its overgrown with several paths. Registration card compiled by Director of the department of preservation of historic and cultural relics. The object boarders road in the east. The conclusion about the cost of the property the object of Is located was commissioned by Lanivtsi town council. The estimation was conducted according to the list of national and international standards of accountancy and cost estimation. Significant Jewish community existed in Lanivtsi in 19thcentury according to 1841 documents about the fire, the entire Jewish quarter with 129 houses was burnt down. There were 2 Synagogues in Lanivtsi in 1870. Location of the object: Cemetery is located in the eastern section of the town of Lanivtsi on the intersection of Kotlyarevskogo Str. & Ukrayinska Str. 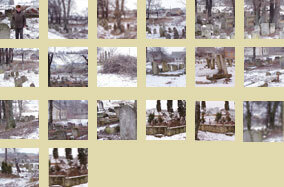 Description of the object: There are not more than 197 tombstones. There are also mass graves of Jewish people shot in 1942. The cemetery is not fenced around; its overgrown with several paths. Renovations, partly loses and new historical layers: The object was changed, the tomb stones partly lost, mass graves of Jewish people shot in 1942 are located there. Description of the territory of the object: Object is located in the eastern section of the town. Date and # of certification of the object property value and the name of the organization which conducted the objects estimation : As of May 31, 2012, property value is 37400 Hryvnias , independent estimation conducted by LTD Orientyr-Reforma (licence # 11620/11 as of April 7, 2011). Territory of the object: The object boarders road in the east, Jewish mass grave in the west, roads in the south and east. Bibliographic sources: Andrushkiv B. Necropolis of Ternopilshchyna. Ternopil, 1998, page 34. Passport is compiled by senior researcher of the department of preservation of historic and cultural relics Grabovyi S.T. on May 2012. Volodymyr Androshuk a local Christian missionary had been to Israel in 1993. In 1999 Voldymyr and his congregates realized that site was in very poor shape. They brought people there to clean and fix it up and take care of it. Volodymyr organized a Forgiveness ceremony. It was the local Lonovitzers who participated in the “forgiveness ceremony.” It was a special occasion to tell Jewish people that the current Ukrainian generation was very sorry that the Ukrainian people collaborated with the Nazis during the war. 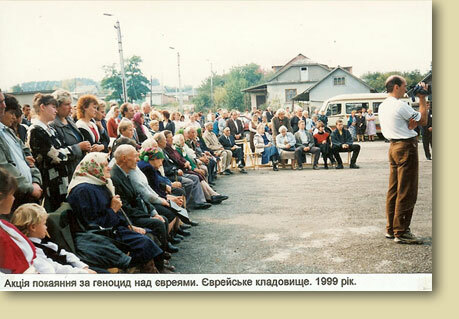 Since that date in 1999, other generations of local inhabitants would know and have the confidence that they wouldn’t be blamed for what was carried out by former generations, and that they would be “forgiven.” Androshuk invited Jews in nearby local communities, along with people in Kiev and Ternopil. They, too, gathered at the massacre site upon the date the “forgiveness ceremony” was held at the Mass Grave Memorial. 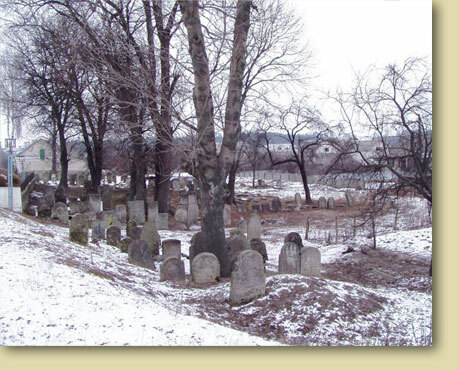 Jews were brought from near by Bilazurka (about 600) and Katerberg ( about 350) to the Lanovtsy Ghetto in early 1942. They were killed in Aug. of 1942 along with the remaining Lanovtsy Jews. In November 2004 I arranged through the local Christian missionary to have the Mass Grave Memorial and “New” cemetery cleared and maintained. I send him money twice a year and one of his parishioners maintains the grounds April through October.